Yoga Retreats - For menu click on the left side. Ever since the Beatles rocked up at the ashram of the Maharishi Mahesh Yogi in the late ’60s, Rishikesh has become a magnet for spiritual seekers from around the planet. Today it styles itself as the “Yoga Capital of the World” – with serious justification – as there are masses of ashrams and all kinds of yoga and meditation classes. Most of this action is north of the main town of Rishikesh, in Ram Jhula and Luxman Jhula where the cold fast-flowing Ganges or Ganga, surrounded by forested hills and peaceful riverbanks, is conducive to meditation. In the evening, the cold wind blows strongly down the valley, setting temple bells ringing as sadhus (spiritual men), pilgrims and tourists prepare for the nightly traditional Ganga Aarti ceremony. Rishikesh is very New Age. You can learn to play the sitar or tabla, try all kinds of yoga including laughing yoga, learn Reiki, practice humming or gong meditation, experience crystal healing and all styles of massage. You may have a go at chanting mantras. You will listen to spiritually uplifting CDs as you sip Ayurvedic tea or the famous hot ginger lemon tea with your vegetarian meals. You may want to try rafting on the Ganga or drive 45 mn to enjoy one impressive view of the Himalayas!! 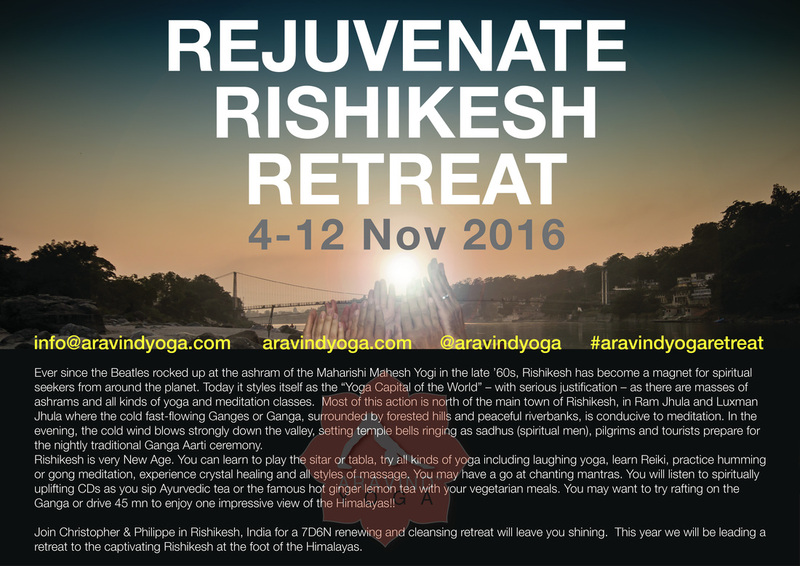 We would like to invite you to join us for a memorable and friendly and recharging retreat in the capital of Yoga! Please check the details of the programme here after. Estimated time of arrival in Rishikesh at 13.15/13.30. 13.00: Walk to Lakshman Jhulan for group lunch at the German bakery. The hotel has a choice of twin beds or kingsize beds for room and superior. Please let us know if you are willing to share a room. a/ Weather: The weather is extremely pleasant in November. Cool in the morning and evenings (around 15c to 18c) and warm during the day (around 25 to 28c). b/ Clothing: No heavy winter coat is required. Lots of beautiful and warm shawls are locally available at very reasonable price! Bookings are to be made individually asap to ensure that we are all on the same flights!! EARLY-BIRD SPECIAL (SINGLE & SHARING BASIS) with 50% non-refundable payment before 31st July 2016. Balance to be paid latest by September 30th 2016. Time to break away from the buzzling city of KL and immerse yourself into the peace and quiet of nature forest Bali. Yoga classes twice a day with Yang practice in the morning while Yin restorative in the evenings. All meals are vegetarian too. Fresh out from the farms in the mountains who lives amongst the area. Sounds intriguing right! Join Chris and Phil for an adventure back to the nature like no other retreats before.